Bush honeysuckles are one of the first plants to green up in the spring and easily dominate this woodland understory. Photo by Kathy Smith, OSU Extension, School of Environment and Natural Resources. The species known as "bush honeysuckle" are upright deciduous shrubs with long arching branches, are commonly 6 to 20 feet tall, and have shallow root systems. They were first introduced into the United States in the mid to late 1800s from Europe and Asia for use as ornamentals, wildlife food and cover, and erosion control. These non-native plants thrive in full sunlight, but can tolerate moderate shade, and are therefore aggressive invaders of a variety of sites including abandoned fields, roadsides, right-of-ways, woodland edges, and the interiors of open woodlands. Honeysuckle out competes and shades out desirable native woodland species, and can form pure, dense thickets totally void of other vegetation. Reproduction and spread is by both sprouting and seeds, which are disseminated primarily by birds. While honeysuckle fruit is abundant and rich in carbohydrates it lacks the high-fat and nutrient-rich content that most of our native plants provide migrating birds. Wherever invasive honeysuckle shrubs displace our native forest species there is a huge potential impact on these migrating bird populations due to the reduction in availability of native food sources. 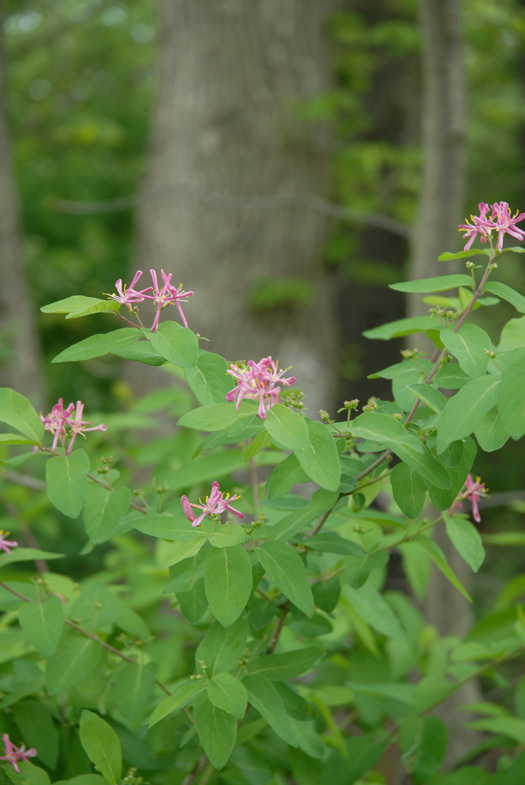 The three most common bush honeysuckle species found in Ohio, Tartarian (L. tatarica), Amur (L. maacki), and Morrow (L. morrowi), can be distinguished from each other by characteristics of their leaves and flowers. Tartarian honeysuckle can hybridize with Morrow resulting in another invasive bush honeysuckle called Bella (L. x bella) or showy fly honeysuckle. This hybrid has characteristics of both parent plants making positive field identification difficult. However, for purposes of control, the non-native bush honeysuckle species can be considered as a group. Leaves—1 to 3.5 inches long without teeth, short stalked, arranged oppositely along the stem; dark green with abruptly long-pointed tip (Amur); or oval to egg-shaped, consistently hairy on the underside (Morrow), or lacking hair on the underside (Tartarian). Stems—grayish-brown, with short hairs on young stems; older, larger stems have broad ridges and grooves and appear striped; older stems are hollow (native honeysuckle has a solid stem). Flowers—fragrant tubular flowers (less than 1 inch long) appear along the stem in pairs from early to late spring; Amur and Morrow typically have white flowers that turn yellow as they age; Tartarian has pale pink to crimson flowers. Fruits—small (1/4 inch) round berries in clusters of 2 to 15; commonly red, occasionally orange to yellow. Fruit is produced from mid-summer through early fall. School of Environment and Natural Resources. When trying to control non-native invasive bush honeysuckle, there are several methods that may be considered. Which method is applied depends on the size of the plants, the size of the infestation, and a landowner's comfort level with the control method. The bush honeysuckles as a group are shallow rooted plants that leaf out before many of our native plants and lose their leaves after many of our native plants. Both of these characteristics give landowners some flexibility in their choice of control options. For a more detailed description of the methods covered below see OSU Extension's Controlling Undesirable Trees, Shrubs, and Vines Forestry Fact Sheet F-45 and Herbicides Commonly Used for Controlling Undesirable Trees, Shrubs, and Vines in Your Woodland Forestry Fact Sheet F-45 Supplement-06. Environmental note: Many of the following herbicides are labeled to be mixed with a penetrating basal oil, diesel fuel, or kerosene as their carrier agent. The choice to utilize a methylated seed oil based basal oil instead of diesel fuel or kerosene will result in a more environmentally friendly practice. However, read the label to ensure using a basal oil is appropriate for the herbicide you have chosen. Tartarian honeysuckle. Photo by Kathy Smith, OSU Extension, School of Environment and Natural Resources. If only a few small plants are present, they can be pulled, dug, cut, or mowed fairly easily. Pulling or digging of small plants is most effective if done following a rain and fairly easy since the plants are shallow rooted. Cutting and mowing is most effective when initiated in early summer when food reserves are at their lowest. In order to achieve control, pulling or digging must be done so that essentially every root is removed. While this is perhaps impossible, if it is repeated frequently, small honeysuckle shrubs can ultimately be eliminated once food reserves are exhausted. The key to this type of control method is to be vigilant. Mechanical control alone is usually not a completely effective method of controlling medium to large bush honeysuckle shrubs. Simply cutting the shrub off at the base will cause prolific sprouting and increase the number of stems. 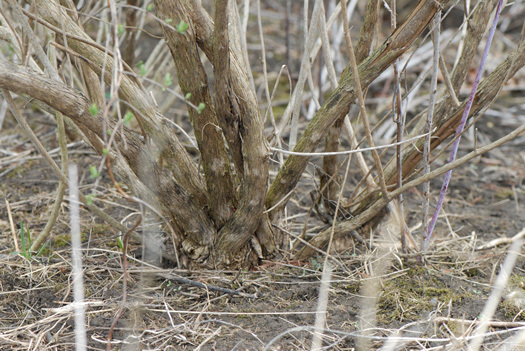 An effective strategy for controlling mature bush honeysuckle will deaden both the above ground portion and the root system, which eliminates the potential for sprouting. This can be achieved most effectively through the use of herbicides. When honeysuckle infestations are so dense that access to the area is limited, landowners may elect to use some mechanical means of removing large plants and a large number of plants. Whether using a skid steer, tractor, or some other piece of equipment to pull the plant out of the ground, realize that some follow-up treatments will be needed. Care needs to be taken that any damage to the residual forest stand is minimal, and a follow-up application of a foliar herbicide should be applied when the remaining honeysuckle roots begin to sprout (see Table 1 for foliar herbicide options). Also, be cautious of the timing of removal. These types of removals may best be done when the ground is frozen or at a minimum when the ground is not wet. Removing vast amounts of plants may result in large areas of disturbed soil and care should be taken to minimize any erosion and compaction potential created when the plants are removed. Honeysuckle sprouts as a result of cutting off the shrub at the ground. A follow-up foliar herbicide application can now be applied. Photo by Kathy Smith, OSU Extension, School of Environment and Natural Resources. Foliar spraying is a method of control in which diluted herbicide is sprayed directly on the leaves of the targeted plants. This can be a very effective method of controlling honeysuckle but should only be used when the target plants are within easy reach of the sprayer. Spraying directed at less accessible plants can damage or kill valuable non-target plants through herbicide drift or overspray. In addition, care needs to be taken to ensure that herbicides are sprayed to wet the foliage but not to the point of runoff. Bush honeysuckle leaves remain green and active late into fall (mid to late October) when most native plant species have gone dormant. Foliar applications of some herbicides can be used at this time with little or no impact to non-target species especially after the first hard frost in the fall. Herbicides recommended for foliar spraying of bush honeysuckle are listed in Table 1. T​able 1: Herbicides recommended for foliar treatment of bush honeysuckle. glyphosate Roundup, Accord, and other herbicides containing at least 41% glyphosate Apply solution of 2% herbicide in water (vol/vol) when leaves are green; add a surfactant if not in herbicide. 2,4-D + triclopyr Crossbow Wet foliage and stems with 1–1.5 gallons Crossbow in 100 gallons water; spot spray with 0.25 pt (1/2 cup) Crossbow in 3 gallons water. *A surfactant at .25% vol/vol rate may be added to the various triclopyr formulations when foliar spraying. 1These comments are not intended to be a substitute for the herbicide labels. To ensure the safe and effective use of the herbicides recommended in this publication read the label and SDS (Safety Data Sheet). Cut stump treatments are a very effective method for controlling many undesirable woody shrubs and work well on bush honeysuckle. This method involves cutting the shrub off close to the ground and applying an herbicide to the cut surfaces (and sometimes the bark) with a spray bottle, paintbrush, roller, or wicking device. Whether to use an oil or water soluble herbicide depends on the timing of the herbicide application after the cut. Herbicides carried in water should be applied to the outer 1/3 of the top of the stump within minutes of making the cut. Utilize an oil soluble herbicide when planning to cut and later return to treat the stumps. Apply the oil soluble herbicide to the entire top and sides of the cut stump but not to the point of excessive runoff. Apply anytime as long as the stumps are dry and not frozen. Herbicides (both water- and oil-soluble) recommended for cut stump treatments of bush honeysuckle are listed in Table 2. Late summer, early fall, or dormant season applications have all proven to be effective. Avoid applications during sap-flow (spring) as this lessens the effectiveness of the herbicide application. T​able 2: Herbicides recommended for cut stump treatment of bush honeysuckle. glyphosate Roundup, Accord, and others Apply 20% active ingredient to outer third of cut stem/stump surface immediately after cutting. 2,4-D + picloram Pathway, Tordon RTU Apply undiluted to surface of cut stem immediately after cutting. Tordon 101 Apply undiluted or diluted 1:1 with water. 2,4-D + triclopyr Crossbow Apply solution of 4% Crossbow in diesel fuel, fuel oil, or kerosene. triclopyr Garlon 4, Garlon 4 Ultra, Tahoe 4E, Remedy, and others Apply 20% Garlon 4 + 10% penetrate (e.g. Cide-Kick II) in diesel, fuel oil, kerosene, or basal oil (penetrate not needed with basal oil). A basal application of herbicide needs to be made to the lower 12–18 inches of the honeysuckles' stems. Photo by Kathy Smith, OSU Extension, School of Environment and Natural Resources. A basal application for bush honeysuckle refers to the spraying of a labeled herbicide mixed with an oil-based carrier on the lower 12–18 inches of the stem. The herbicide is sprayed, ensuring that the stems are wet but not to the point of runoff. Basal treatments should only be applied when the areas to be treated are dry and not frozen. The basal treatments recommended in Table 3 should be applied during the dormant season (winter or spring). Due to the arching nature of bush honeysuckle shrubs, access to the lower portion of the shrubs trunk is not always easy to achieve. Care should be taken to ensure that the chemical being applied is reaching the lower portion of the shrub's trunk and not merely being applied in its general vicinity. Table 3: Herbicides recommended for basal spraying of bush honeysuckle. triclopyr + imazapyr Garlon 4 and Stalker Apply a solution of 15% Garlon 4 + 3% Stalker + 82% Ax-It basal oil mixed by volume. triclopyr Garlon 4, Garlon 4 Ultra Apply a solution of 20% Garlon 4 in basal oil (Ax-It or Arborchem). Diesel fuel may also be used as a carrier but this requires that a 10% penetrant (such as Cide-Kick II) must also be added. 2,4-D + triclopyr Crossbow Apply a 4% solution of Crossbow in diesel oil, fuel oil, or kerosene. Label recommendations must be followed to maximize the potential for successful control. Just as important as the initial work is the follow up. Several of the treatments detailed in this fact sheet take time to completely deaden bush honeysuckle. Monitor treated plants for at least one year to determine if complete control is achieved. Any plants that re-sprout or are not completely killed by the first treatment will warrant a follow up treatment. Herbicides, like all pesticides, are registered and approved (labeled) for specific uses by the Environmental Protection Agency. Approved uses and application methods are listed and described on the pesticide's label. The herbicides listed in this fact sheet were appropriately labeled at the time of publication. Because pesticide labeling may change at any time, you should verify that a particular herbicide is still labeled for your intended use. At the time of publication, copies of most herbicide labels and SDS could be obtained online at the Crop Data Management System web site (cdms.net/Label-Database). Others are available through the individual manufacturer's website.